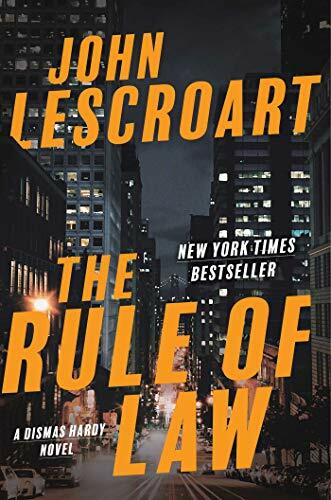 The Rule of Law is the 18th novel in the Dismas Hardy legal thriller series by long-time bestselling author John Lescroart. Its plot has two centers, kind of like a peach pit with two seeds or a Venn diagram with overlapping circles, and they should probably be considered in the order in which they appear in the novel. The hook for this story involves criminal defense attorney Dismas Hardy’s longtime secretary, Phyllis, who unexpectedly misses time at work after 40 years of unwavering regularity and predictability. Hardy’s so upset by this unexpected turn of events that he breaks into her apartment. While looking for clues to her behavior he discovers a handgun in a night stand drawer, thereby dealing the titular rule of law an early set of bruises. When Phyllis is subsequently arrested at the office and charged with being an accessory after the fact to murder, Hardy’s worst fears seem confirmed. The second focus of the plot celebrates the reunion of the Dismas Hardy Band, for want of a better metaphor. Hardy’s friend and former law partner Wes Farrell has been defeated as San Francisco district attorney by the evil and highly compromised Ron Jameson (a murderer married to a murderer, as we’re told right up front in the prologue), and Farrell’s returning to the partnership. Gina Roake has an office down the hall and is once again looking for a piece of the firm’s action. Abe Glitsky, now retired from the San Francisco Police Department, is only a phone call away. Hardy’s problems arise when he wades into the murder case in which his secretary has been implicated. He butts heads with new DA Jameson, who responds by dispatching a loyal investigator to dig up dirt on messy situations from Hardy’s past. As Lescroart explains in his Acknowledgments, he’s reaching back to tie up loose ends from several earlier novels, and long-time series followers will recognize the ragged conclusion to The First Law, the ninth novel in the series, as a primary target of looseness correction. Hard-core Lescroart fans will no doubt be pleased to see their favorite characters back together again as an investigative team; however, readers only casually acquainted with Hardy and the group, or those deciding to try a Lescroart novel for the first time, will find The Rule of Law off-putting and improbable. The dialogue among these people runs a little too cute for a little too long. If you’re new to Lescroart, you’ll find yourself feeling as though you’re on the outside looking in. The cozy closeness seems patterned on previous episodes of a situation comedy you never got around to watching. Furthermore, the dangerous dirt-digging sponsored by DA Jameson to put Hardy and his friends in their place will further confuse newcomers. Were they really involved in this wild-west-style dockside shootout? Was Hardy really careless enough to leave his DNA behind at the scene, and did Abe Glitsky actually abuse his authority by entering the police evidence locker to cover their tracks? Wow. Are these really the good guys? Is the title of this novel supposed to be ironic? Where’s the moral center here? Another block of readers will be alienated by Lescroart’s decision to use The Rule of Law as an opportunity to take on the hot-button issue of illegal immigration, specifically San Francisco’s status as a sanctuary city and the ongoing plight of the DREAMers. Folks who hold the opposite political view to the one he supports here will definitely be frothing at the mouth after reading this story. Mind you, there’s absolutely no reason why New York Times bestselling authors shouldn’t take advantage of their considerable pulpits to voice their opinions on political and social issues of this magnitude. After all, didactic fiction has been around for a very, very long time. It’s a decision that comes with consequences, however, as a certain percentage of readers will excoriate him for the politics in the novel and not bother to consider the book’s relative value as entertainment, which is what one’s normally looking for when picking up a new legal thriller. Let’s help out by putting politics aside for a moment: The Rule of Law errs in failing to tell a convincing story involving characters who are worthy of our trust. An exercise in recursion, it relies on its own series arc to fuel its plot, and it provides new readers with absolutely no reason to want to read anything else by this author in the future.